Dec 18th, 2017: Featured on the Canadian Gift Guide's teenager trinkets: stocking stuffers for teens & tweens. Dec 4th, 2017: Featured on OttawaLife Magazine's next level shopping guide. Nov 30th, 2017: Caleigh Alleyne stops by CTV to talk travel essentials from Showcase. Sept 18th, 2017: What's popping with Popsockets? Aug 25th, 2017: Serena and Gigi have one. Do you?! Aug 25th, 2017: What are Popsockets, and why are they the next spinner? Aug 22nd, 2017: LOVE Popsockets? Celebrities do too! Check out these stars showing their love for Popsockets. Aug 17th, 2017: Things under $20 that will radically improve your life. Aug 11th, 2017: Popsockets are the secret weapon of social media pros! July 31st, 2017: The One Essential Phone Accessory You're Missing. Feb 3rd, 2017: Are PopSockets worth the hype? Jan 18th, 2017: Tech Void calls PopSockets "the best smartphone accessory". Jan 17th, 2017: Popping over 100 PopSockets! Sept 24th, 2016: 5 Questions with PopSockets CEO Tom Croke. May 27th, 2016: Check out this PopSockets review! April 8th, 2016: How to remove and reposition PopSockets. 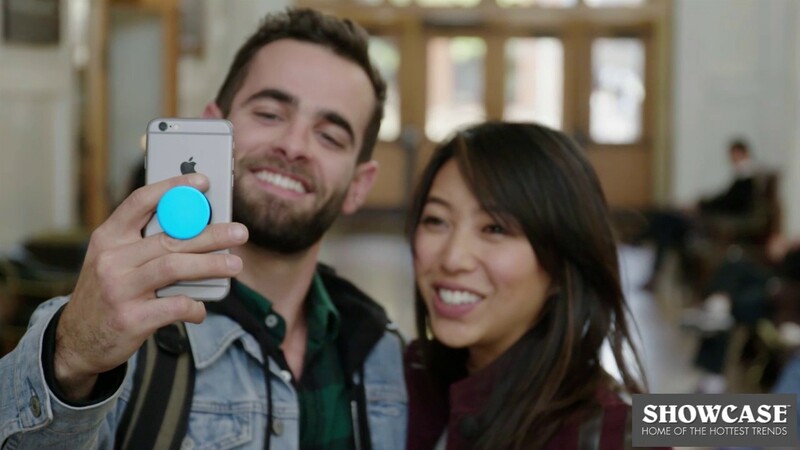 Most mobile devices could benefit from attaching a PopSocket or two! Adding one of these useful little gizmos immediately improves your mobile experience; "popping" out to provide a grip, a stand, somewhere to wind up your earphones, or just something for idle hands to play with. PopSockets are also suitable for getting a firmer, more comfortable grip on tablets and e-readers, and adhere to most standard devices and their cases. You could even stick your PopSocket to vertical surfaces, such as mirrors and refrigerators, for a quick stationary solution to hanging lighter items like jewellery and lanyards. Please note that whilst Popsockets are suitable for most applications, they do not stick to silicone surfaces or those with a waterproofed coating. Includes (1) PopSocket (PopClip accessory sold separately).